JC7641. Sanidine. Itrongay, Betroka dept., Fianarantsoa prov., Madagascar. 3 x 3.5 cm 36g. $100.00. Although a somewhat crude crystal, it is nearly all flawless gem grade material on the interior. JC9218. Scheelite, quartz, dolomite. Yaogangxian mine, Yizhang county, Chenzhou prefecture, Hunan province, China. 7 x 9 cm 238g. $100.00 Several root beer brown crystals resting on quartz and dolomite. JC9218. Another view, back side. JC8737. Scheelite, fluorite. Camp Bird mine, Sneffels district, Ouray, Ouray district, San Juan mountains, Ouray county, Colorado. 4 x 6 cm 36g. $50.00 These came out around 1980 and made quite a splash at the time, demanding high prices. This is one of the specimens from the original find at a more reasonable price. JC8289. Scheelite, ferberite, calcite. Yaogangxian mine, Yaogangxian W-Sn ore field, Yizhang county, Chenzhou prefecture, Hunan province, China. 3.5 cm tall x 1.6 cm wide. 19g $35.00. An 8mm scheelite plus others on the back. Calcite coats the ferberite crystal and some of the scheelite crystals. .
JC8648. Scheelite. Xuebaoding mountain, Pingwu, Sichuan, China. 7.5 x 8 cm 301g. $150.00. Sawn back. Group of honey colored crystals. ON SALE, TAKE 20% OFF THE MARKED PRICE. JC8024. Scheelite, muscovite on beryl. Xuebaoding W-Sn-Be deposit (Huya W-Sn-Be deposit), Huya township, Mt. Xuebaoding, Pingwu county, Mianyang prefecture, Sichuan province, China. 5 x 6.5 cm 101g. $200.00. Bright orange crystal nestled in muscovite on one end, the whole perched on crudely crystallized beryl. Somewhat older specimen. JC8024. Close up of the scheelite crystal. JC8646. Schorl, muscovite. Erongo, Namibia. 5 x 7 cm 179g. $125.00 Schorl covered with muscovite with schorl on muscovite. ON SALE, TAKE 20% OFF THE MARKED PRICE. JC8577. Schorl. San Diego area (Pala district? ), California. 5.5 cm tall. 38g. $10.00 velvety group of crystals. Neither end is terminated. JC9776. Siderite, pyrite, and ?. Eagle mine, Gilman, Eagle county, Colorado. 7.5 x 8 cm 499g. $48.00. One of the older pieces, from the upper parts of the mine. Brown, bladed siderite on a matrix of pyrite micro-crystals and sphalerite? micro-crystals. JC9730. Siderite, sphalerite. Rivet quarry, Montredon-Labessonnie, Realmont, Tarn, Occitanie, France. 2.5 x 3.2 cm 16g. $6.00 I didn't note any damage to the naked eye. JC9200. Siderite. Tindalls mine, Tottenham district, Flinders county, New South Wales, Australia. 5.5 x 8.5 cm 204g. $50.00. A little known quarry, with very few specimens extant. I could not find a whole lot of information on this locality. Has produced both siderite, calcite and chalcopyrite. 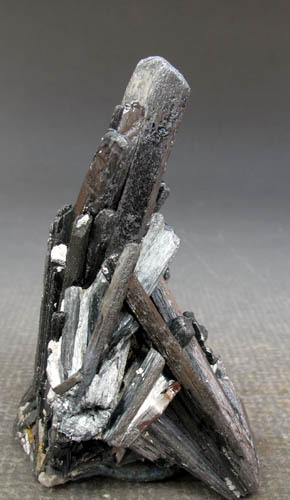 This specimen is shown as a photo on mindat, with iron staining coating the crystals. I removed the iron staining, to show the true color of the crystals which is a beige, rather than the golden brown shown on the mindat photo. JC8766. Siderite, dolomite. Morro Velho mine, Nova Lima, Iron Quadrangle, Minas Gerais Brazil. 7 x 8 cm 313g. $150.00. Another relative old timer. There are a couple of cleaved dolomite crystals that do not detract from the specimen. Scarce material these days. Collected in the 1960's. JC8763. Siderite, calcite. Neudorf, Harzgerode mining district, Harz, Saxony-Anhalt, Germany. 7.5 x 9.5 cm 536g. $300.00. An old-time, desirable European classic of rich color and quality. The calcite crystals add a nice contrast and are nice and sparkly. JC7766. Siderite, calcite, siderite epimorph after calcite. Broken Hill Mine, Aggeneys, Namakwa District (Namaqualand), Northern Cape Province, South Africa. 5 x 6.8 cm 74g. $185.00. Rather neat epimorph from this little known location. The crystals are completely hollow, as can be seen in the lower photo. ON SALE, TAKE 20% OFF THE MARKED PRICE. JC7766. Showing the hollow crystals. JC8958. Silver. Uchucchacua mine, Oyon province, Lima department, Peru. A 4 cm long wire...longer if stretched straight. $75.00. JC8959. Silver. Tsumeb mine, Tsumeb, Namibia. 1.5 x 2.5 cm thumbnail. $50.00. Silver from Tsumeb is quite rare. A little patch of crystals on calcite/dolomite? JC8910. 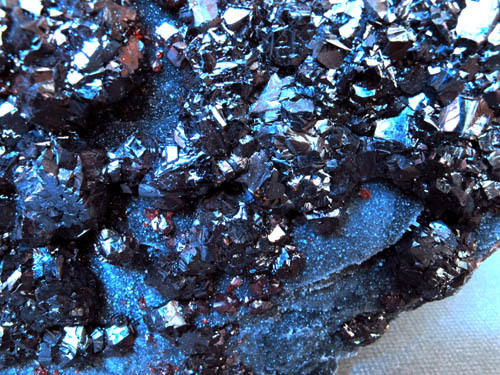 Silver (bornite coated), on massive bornite. San Martin mine. San Martin-Sabinas district, San Martin, Municipio de Sombrerete, Zacatecas, Mexico. 5 x 6 x 9 cm 393g. $100.00. A leaf of silver protruding from matrix with the silver covered by a thin layer of bornite, giving it an iridescent purple color. JC8910. Another view showing the silver leaf protruding from the bornite matrix. JC8830. Silver. Keeley-Frontier mine, South Lorrain township, Cobalt-Gowganda region, Timiskaming district, Ontario, Canada. 5.5 x 6.7 cm 159g. $150.00. Sort of leafy looking silver embedded in matrix. Mine was shut down in 1965, so the specimen predates 1965. In this photo, it occupies the left side of the specimen. JC8830. A view showing the silver in the upper right as a thin, leafy appearing plate. JC8830. Another view showing the silver in the upper left of the specimen. JC8694. Silver, barite, unidentified sulfide. Bulldog Mountain mine, Creede district, Mineral county, Colorado. 3.5 x 4.3 cm 24g. $35.00. The silver is the light beige/light brown on the right of the black sulfide band. The white material is barite. Sawn face. ON SALE, TAKE 20% OFF THE MARKED PRICE. JC8038. Silver, cobaltite. Cobalt area, Cobalt-Gowganda region, Timiskaming district, Ontario, Canada. 3 x 5.5 cm 85g. $100.00. A mass of sparkly silver and cobaltite. Did not photo too well. Looks much better in person. The silver is pinkish in color while the cobaltite is more silvery/gray. JC9770. Smithsonite. Refugio mine, Choix, Sinaloa, Mexico. 5 x 10 cm 189g. $325.00. Pink to slightly lilac pink specimen from this now exhausted locality. Specimen is not back lit. JC9761. Smithsonite. Hidden Treasure mine, Ophir Hill area, Ophir district, Oquirrh mountains, Tooele county, Utah. 4.5 x 8 cm 136g. $45.00. Light blue botryoidal smithsonite, with a hint of gray to the blue color. Sparkly, colorless smithsonite micro-crystals on the back side. JC9385. Smithsonite pseudo calcite. San Antonio mine, Mun. de Aquiles Serdan, Chihuahua, Mexico. 6 x 10 cm 415g. $85.00. Ex Jimmie Du Foe collection; ex Charles Noll collection. Lustrous olive smithsonite has replaced the dog tooth style calcite crystals. JC9342. Smithsonite. Lavrion district mines, Lavrion district, Attiki prefecture, Greece. 5 x 9 cm 219g. $125.00 An older piece of solid light blue smithsonite. JC9135. Smithsonite. El Refugio mine, Choix, Sinaloa, Mexico. 6 x9 cm 207g. $160.00. Robins egg blue (almost) on this rounded plate of smithsonite from this now classic locality. JC8829. Smithsonite (cobaltoan). Tsumeb mine, Tsumeb, Namibia. 4.5 x 8cm 158g. $125.00. Pink, somewhat flattened rhombohedral to discoidal crystals scattered through a grayish matrix. JC8799. Smithsonite (cuprian). Tsumeb mine, Tsumeb, Namibia. 4 x 5.5 cm 73g. $150.00. Group of sharp, light lime green rhombohedrons. ON SALE TAKE 20% OFF. JC8614. Smithsonite (cuprian). Tsumeb mine, Tsumeb, Namibia. 4 x 4.5 cm 61g. $175.00. Group of sharp, lime green rhombohedrons. ON SALE TAKE 20% OFF. JC8774. Smithsonite. Tsumeb, Namibia. 7.5 x 9.5 cm 231g. $150.00 Brilliant, striated, gray to colorless crystals heavily coat the display side and partially coat the other sides of this older specimen collected in the 1940-1950 time period. Has an old label says it is from the Muller collection, Kirberg. JC8774. Another view, close up. JC8355. Smithsonite (cobaltoan). Tsumeb mine, Tsumeb, Namibia. 8 x 12 cm >1000g. $350.00. A large and heavy smithsonite. The rhombs are up to 1.2 cm across, with a light creamy pastel pink color. The only damage to the rhombs I can see is the center rhomb has three quite small dings in it. There are two vugs present. The main center one, and another on the top left. Ex. Art Soregaroli collection. JC8355. Another view. Not quite as close as the one above. JC8325. Smithsonite. El Refugio mine, Choix, Sinaloa, Mexico. 5 x 7.5 cm 63g. $200.00. There is a fair amount of pink smithsonite from Choix, but I haven't seen many with this hot pink color, more intense than usual. The mine is now closed and buried...no more coming out from what I hear, and assume is accurate. JC7702. Smithsonite. Broken Hill mine, Broken Hill, Yancowinna County, New South Wales, Australia. 5 x 5.5 cm 121g. $90.00. Nice rice grain smithsonite, with a very pale ice blue color. JC7027. Smithsonite. San Antonio mine, Santa Eulalia, Chihuahua, Mexico. 5 x 5 cm 218g. $15.00. Translucent gray smithsonite. Sawn back. JC3665. Smithsonite. Choix, Sinaloa, Mexico. 7 x 13.2 cm. 487g. $125.00. Pretty, lilac pink. JC3469. Smithsonite. Choix, Municipio de Choix, Sinaloa, Mexico. 7 cm x 10 cm. 493g. $175.00. Pretty, lavender pink, botryoidal smithsonite. JC9505. Spessartine, galena. Broken Hill, Broken Hill district, Yancowinna county, New South Wales, Australia. 3.7 x 5 cm 120g. $60.00. 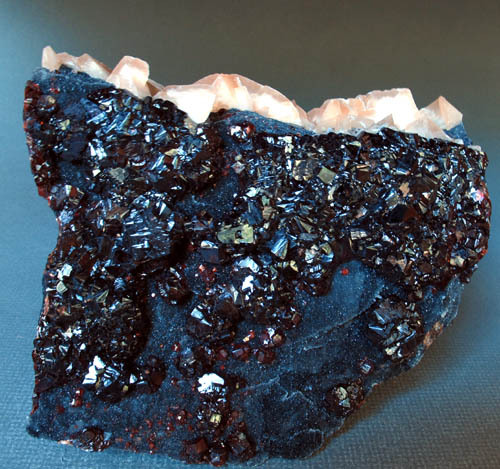 Several wine red crystals embedded in galena, very typical for these. Smaller, and mostly incomplete crystals are along the top half of the specimen. JC9487. Spessartine. 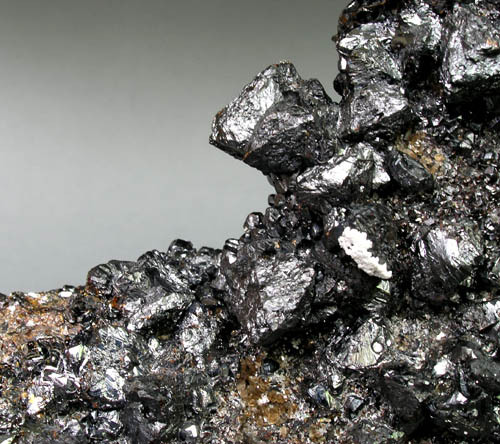 Wushan spessartine mine, Tongbei, Yunxiao county, Zhangzhou prefecture, Fujian prov., China. 8 x 16 cm 619g. $140.00. Plate of crystals with several small quartz crystals present. The quartz crystals are capped by a white unknown, probably an amorphous silica material. There is a minor bruise near the top center, not obvious. Sawn back. JC9481. Spessartine. Wushan spessartine mine, Tongbei, Yunxiao county, Zhangzhou prefecture, Fujian prov., China. 5 x 8 cm 110g. $45.00. Bright orange crystals on both sides. JC9479. Spessartine, quartz. Wushan spessartine mine, Tongbei, Yunxiao county, Zhangzhou prefecture, Fujian prov., China. 4 x 7 cm 68g. $55.00. Sawn back. Light smoky quartz crystals with gemmy spessartine. JC9324. Spessartine. Wushan spessartine mine, Tongbei, Yunxiao county, Zhangzhou prefecture, Fujian province, China. 4.5 x 5 cm 106g. $20.00. 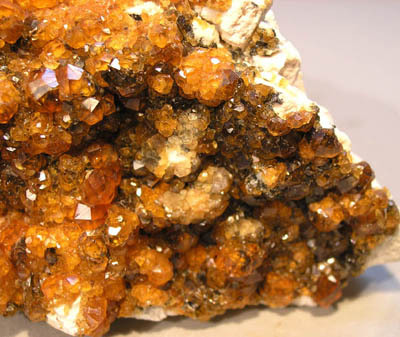 Orange to slightly orange brown crystals of spessartine with small light smoky quartz crystals. JC9297. Spessartine, quartz. Wushan Spessartine mine, Tongbei, Yunxiao Co., Zhangzhou prefecture, Fujian province, China. 9 x 12 cm 480g. $160.00 I have looked at a lot of spessartine specimens from this location and this one is unique to me. The entire matrix is covered with small, brilliant, light smoky to clear quartz crystals with lots of sparkle; implanted on the quartz are a myriad of wine red spessartine crystals, the largest at about 7mm diameter. The spessartines are gemmy, and light to dark wine red in color. The smaller spessartines are gemmy and transparent, looking like little red jewels sitting on the quartz. Ex Charles Noll collection and an older piece for this locality. Much better in person...the camera cannot capture the sparkle of the quartz and spessartine. I think this is a really great piece for its beauty. JC9243. Spessartine. Wushan spessartine mine, Tongbei, Yunxiao county, Zhangzhou prefecture, Fujian prov., China. 7 x 10 cm 346g. $200.00. Nice coverage of brilliant, gemmy crystals. A dark chlorite like mica is also present. Good specimens of this quality are becoming much less common and rather expensive. JC9134. Spessartine, quartz, mica. Wushan spessartine mine, Tongbei, Yunxiao county, Zhangzhou prefecture, Fujian prov., China. 7.5 x 8 cm 226g. $150.00. Single quartz crystal protruding from a mound of orange spessartine crystals. One blemish on the right side as seen in this photo. JC8622. Another view. Quartz crystals are a little more obvious in this view. JC7971. Spessartine. Tomboarivo Pegmatite, Sahanivotry, Madagascar. 3 x 5 cm 38g. $50.00. A 14mm wine red crystal on a feldspar/quartz matrix. Somewhat gemmy as can be seen from the photos. JC7678. Spessartine, quartz, muscovite. Wushan mine, Tongbei, Yunxiao county, Zhangzhou prefecture, Fujian prov., China. 6 x 8.5 cm 256g. $45.00. Flat plate of bright crystals. Some short smoky quartz crystals are also present. JC7017. Spessartine, quartz. Wushan mine, Tongbei, Yunxiao county, Zhangzhou prefecture, Fujian prov., China. 3.5 x 9 cm 75g. $65.00. Smoky quartz crystals with spessartine. JC6713. Spessartine. Haramosh mountains, Skardu district, Gilgit-Baltistan province, Pakistan. 4 x 7.5 cm 449g. with stand. $125.00. Wine red crystals coating the face of what appears to have been a seam in the pegmatite. Some of the crystals are whole, and others appear to have interference growth faces on the crystals, where either other crystals grew against them, or the opposite side of the seam impinged on their growth. Matrix is albite. Colorful and displays nicely. It is on a stand with hot glue/silicon as the attachment material. ON SALE, TAKE 20% OFF THE MARKED PRICE. JC3245 Spessartine, orthoclase. Wushan mine, Tongbei, Yunxiao county, Zhangzhou prefecture, Fujian prov., China. 6.3 cm x 10 cm $65.00. Gemmy, transparent crystals. 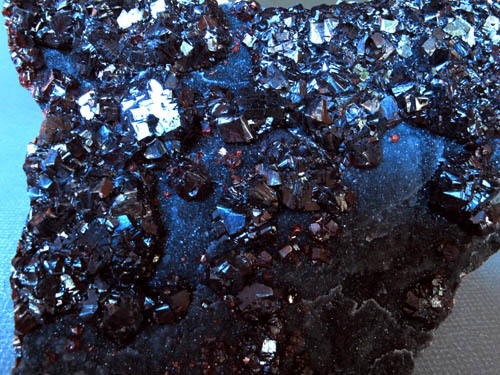 There is a dark mineral either directly under some of the crystals or in the base of some of the crystals. Its hard to tell. Lots of sparkle and displays well. ON SALE, TAKE 20% OFF THE MARKED PRICE. JC9301. 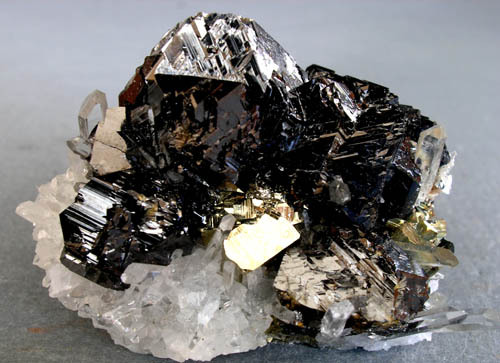 Sphalerite, galena, siderite, pyrite. Eagle mine, Gilman, Eagle county, Colorado. 8 x 10 cm 222g. $100.00. 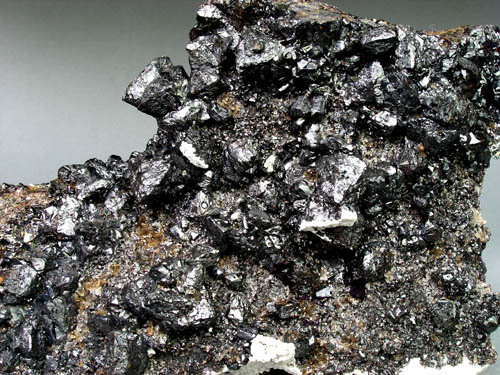 Brilliant black sphalerites with several silvery gray galena crystals on the sphalerite. Siderite/ankerite on the back with minor pyrite. One of the better pieces I have seen from Gilman in quite some time. Lots of sparkle to the sphalerite. Some rubbing on a couple galena cubes. JC9050. Sphalerite, galena, fluorite, rhodochrosite?. Julia Fisk mine? Leadville?, Lake county?, Colorado. 8.5 x 11.5 cm 608g. $100.00 Flat plate with bright, metallic, slightly melted look galena, black sphalerite and little mounds of a pinkish mineral I'm not sure about (rhodochrosite?). There are small (5mm or so) colorless fluorite crystals on the backside. This was one of several specimens a gent sold me in the parking lot at one of the Tucson venues. His label said Eagle mine...definitely not Eagle mine. All of the other rather dirty minerals are obviously Colorado. I can't recall ever seeing any Leadville or other Colorado specimens with fluorite on them that look like this...anyone has any ideas on where this might be from? JC9050. Back side. A few small 5mm or so colorless fluorites are scattered about. The cream colored mineral appears to be the same as on the front of the specimen. JC9080. 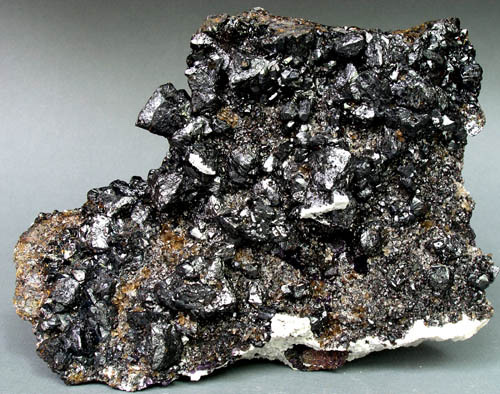 Sphalerite, marcasite, barite. G.P. Materials South Quarry, Potosi, Potosi Barite District, Washington Co., Missouri 5 x 6 cm 234g. $35.00 These specimens are from a new find. I have not seen anything quite like this before. The top side of this 5 x 6 cm matrix is covered with pretty golden to peacock colored iridescent micro marcasite crystals. 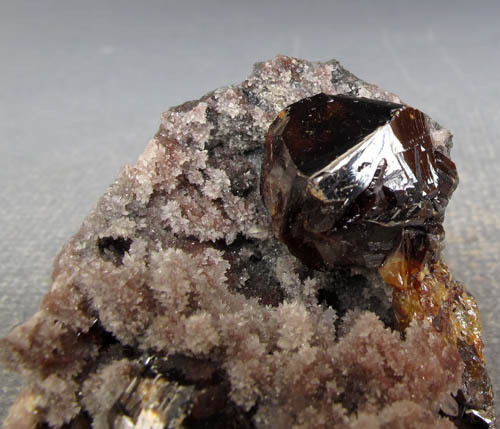 mostly coating the marcasite are spherical shaped sparkling brown to reddish brown crystal groupings of sphalerite measuring to about 1.5 cm in size. There is some minor chipping to some of the sphalerite crystals, which is typical of this find. I looked at most of the lot of these I saw at the show, and very, very few were free of this minor damage/touching of the crystal spheres. This specimen has a large subhedral barite crystal attached. JC9083. Sphalerite, marcasite. G.P. Materials South Quarry, Potosi, Potosi Barite District, Washington Co., Missouri 6 x 8 cm 119g. $60.00 These specimens are from a new find. I have not seen anything quite like this before. The top side of this 6 x 8 cm matrix is covered with pretty golden to peacock colored iridescent micro marcasite crystals. 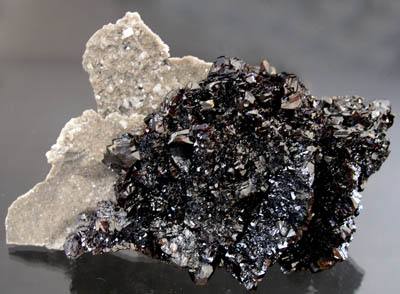 Scattered thickly across the marcasite are spherical shaped sparkling dark brown/reddish brown crystal groupings of sphalerite measuring to about 1.5 cm in size. There is some minor chipping/rubbing to some of the sphalerite crystals, which is typical of this find. I looked at most of the lot of these I saw at the show, and very, very few were free of this minor damage/touching of the crystal spheres. JC9084. Sphalerite, marcasite. G.P. Materials South Quarry, Potosi, Potosi Barite District, Washington Co., Missouri 4 x 8 cm 71g. $40.00 These specimens are from a new find. I have not seen anything quite like this before. The top side of this 4 x 8 cm matrix is covered with pretty golden to peacock colored iridescent micro marcasite crystals. 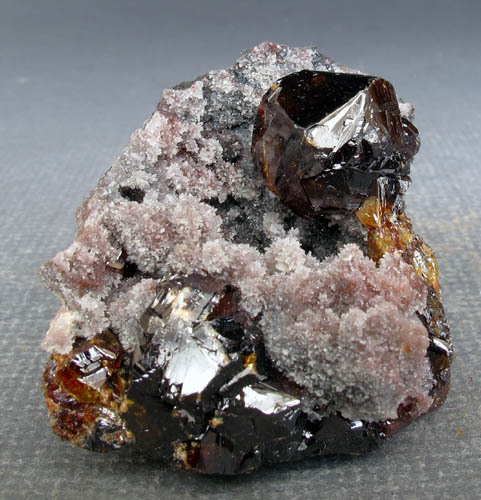 Scattered across the marcasite are spherical shaped sparkling dark brown/reddish brown crystal groupings of sphalerite measuring to about 1.5 cm in size. There is some minor chipping/rubbing to some of the sphalerite crystals, which is typical of this find. I looked at most of the lot of these I saw at the show, and very, very few were free of this minor damage/touching of the crystal spheres. JC8278. Sphalerite. Brownley Hill mine, Nenthead, Alston Moore district, Cumbria, England. 6 x 8.5 cm 351g. $80.00 Brilliant, black, small crystals heavily coating a knobby matrix. Nicely 3 dimensional. Has a small crystal of what appears to be dolomite on the upper right. JC7764. Sphalerite, quartz. Casapalca, Casapalca district, Huarochiri province, Lima department, Peru. 3.5 x 4.9 x 6.8 cm 73g. $35.00. 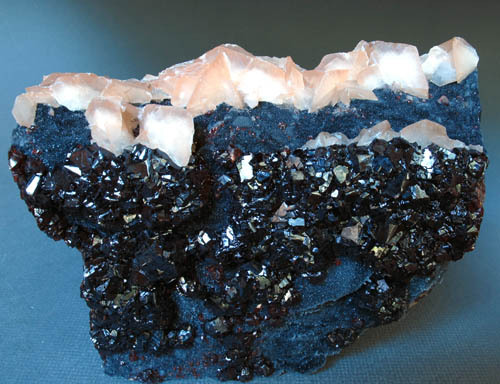 Bright sphalerite interspersed with quartz crystals. JC7380. Another view. The brownish color is a reflection, not the actual crystal color. JC7271. Sphalerite. Trepca, Trepca valley, Kosovo Mitrovica, Kosovo. 6.5 x 9.5 cm 304g. $135.00. 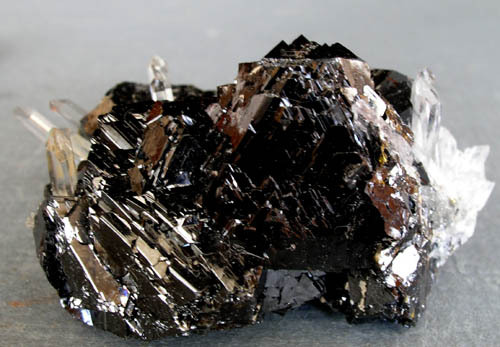 A brilliant group of black crystals; very pretty. JC6908. Sphalerite. Shuikoushan mine, Changning city, Hunan province, China. 3.5 x 4.5 cm 68g. $35.00. A bright gemmy crystal dominates the specimen on tiny drusy quartz. There is a very small ding on the termination of the crystal. Two views are shown. JC6908. A close up view. JC6744. 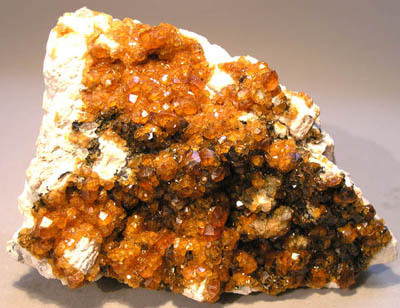 Sphalerite, calcite. Rucheng mine, Chaojia, Nuanshui, Rucheng county, Chenzhou prefecture, Hunan province, China. 12 x 13 cm >1000 g, $125.00. 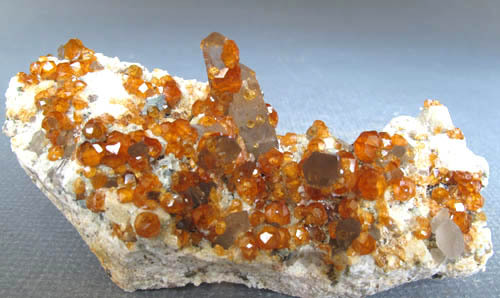 Amber-red crystals on matrix, with a mantle of somewhat flattened rhombohedrons of calcite along the top edge. There is some damage to the calcites. The sphalerites are gemmy, and the little ones are transparent as can be seen by the red color of these crystals. A nice specimen. JC6744. Another view showing the calcite a bit better. JC6744. Close up of the bottom right edge. JC6744. Close up of the center bottom. JC5281. Sphalerite, fluorite. Cave-in-Rock, Hardin Co., Illinois. 11 x 16 cm >1000g. $150.00. This is a large cabinet specimen of almost all sphalerite from one of the mines in the Hardin County fluorspar belt. Obviously an older piece. I can't recall seeing a large cabinet specimen like this in many years. Although not visible in the photos, there are a couple of small, 3mm or so, purple fluorites scattered around on the lower area of the specimen. There are quite a few small purple fluorites on the back. It looks better in person, as it is hard to capture the 3 dimensional nature of the sphalerite crystals sticking up from the matrix. ON SALE, TAKE 20% OFF THE MARKED PRICE. JC5281. Close up of the center right area. JC5281. Close up view of the upper right area. JC5281. A closer view of the odd shaped sphalerite crystals. JC5145. Sphalerite, quartz, pyrite. Animon mine, Huaron, Pasco prov., Cerro de Pasco dept., Peru. 3.5 x 4.8 cm 56g. $50.00. Collected in 1997. A brilliant and showy grouping from here. Quite pretty. A cut above the average. ON SALE, TAKE 20% OFF THE MARKED PRICE. JC3973. Sphalerite on dolomitic matrix. Elmwood mine, Elmwood, Smith County, Tennessee. 5.5 x 10 cm 155g. $35.00. Dark red brown, complex crystal. ON SALE, TAKE 20% OFF THE MARKED PRICE. JC8827. Stibnite, barite. Roata mine, Cavnic, Maramures county, Romania. 6 x 9 cm 171g. $150.00. This might have been better labeled as barite, stibnite. I remember seeing these briefly many years ago, but can't recall exactly when they came out. It was a one time find, as no more have been forthcoming for many years. Small, clear barites with hints of red and orange are liberally and profusely scattered over and coating the stibnite crystals. Quite pretty with lots of sparkle. JC8815. Stibnite, quartz. Murray mine, Independence Mountains district, Elko county, Nevada. 3.5 x 4 cm 42g. $10.00. Massive stibnite coating rock and quartz matrix. JC8813. Stibnite, barite, quartz. Murray mine, Independence Mountains district, Elko county, Nevada. 3.5 x5.5 cm 120g. $12.00. 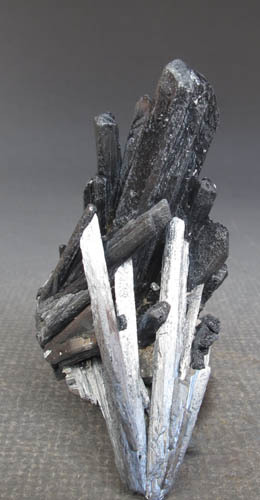 Bright stibnite crystals in a small vug with barite, as well as more massive non-terminated crystals. JC8770. Stibnite. Baia Sprie mine, Baia Sprie, Maramures county, Romania. 7 x 7 cm 61g. $70.00. Spray of crystals, no matrix. Several are broken. JC8749. Stibnite. Wuning?, China. 9.5 cm long. 14g. $20.00 Has a flat termination. JC8068. Stibnite with quartz coated barite. Murray mine, Jerritt canyon, Elko county, Nevada. $25.00 A 4 cm tall group of crystals. JC6913. Stibnite. Raura, Cajatambo province, Lima department, Peru. 3 x 6.2 cm $35.00. Collected in 1994. JC3686. Stibnite. Wuning mine, South side of Xiushui river, near Qingjian village, Mt. Tuobei, Wuning County, Jiangxi, China. 2.5 cm x 15.2 cm. 109g. $125.00 Bright, steely crystals with good terminations. JC3687. Stibnite. Wuning mine, South side of Xiushui river, near Qingjian village, Mt. Tuobei, Wuning County, Jiangxi, China. 2.5 cm x 14 cm. 82g. $110.00. 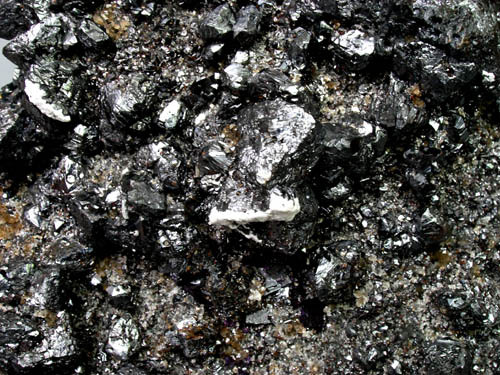 Bright, steely crystals with good terminations. JC9753. Stilbite. Strond quarry, Borooy Island, Faroe Islands, Denmark. 3 x 6 cm 49g. $6.00. JC9743. Stilbite, heulandite. Jalgaon district, Maharashtra, India. 5 x 6 cm 73g. $6.00. No obvious damage. JC8600. Stilbite, apophyllite. Pune district, Maharashtra, India. 6.5 x 6.5 cm 99g. $25.00. Pleasing group of blocky apophyllite crystals with a nice stilbite topping it off. JC8029. Stilbite. Basalt quarry, Ambarjomiambana, Sambava district, Sava region, Antsiranana province, Madagascar. 7 cm tall crystal. $25.00. A nice sharp single crystal from a lesser known location. Ex Scott Werschky collection. JC8020. Stilbite. Pune district (Poona district), Maharashtra, India. 4 x 6.5 cm 25g. $15.00. Nicely perched penetration twins. JC353. Stilbite. Teigarhorn, East Iceland. 7.7 x 7.7 cm. 209g. $35.00. Another older piece...1960's or older. Some matrix on front where specimen was in contact with vug walls. Rare old specimen. ON SALE, TAKE 20% OFF THE MARKED PRICE. JC8717. Stolzite pseudo scheelite, Thompson workings, Darwin mine, Darwin, Darwin district, Inyo county, California. 4.5 x 5.5 cm 140g. $75.00. These were initially thought to be scheelite, but work at the Mackay school of mines confirmed that they are Stolzite pseudomorphose after scheelite crystals. Found in 2006, this particular batch has proven to be a one time find. This would make them some of the world's best stolzites if you don't mind the fact they are pseudomorphs. Colors on these vary from light tan to light gray. Some of them have a bit of luster when turned in the light. This one is a solid mass with 2 crystal, one is 2 cm, the other smaller. JC3907. 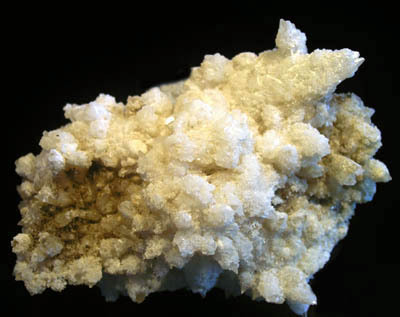 Strontianite on calcite. Minerva #1 mine, Cave-in-Rock, Rosiclare dist., Hardin Co., Illinois. 6 x 9.5 cm. 204g. $35.00. ON SALE, TAKE 20% OFF THE MARKED PRICE.